Well, Saints had their arses kicked and no mistake. And do you know what? Strangely, I am not that bothered. Maybe Wednesday nights game had something to do with it. I went in the expectation of seeing a night of celebration, whatever happened on the pitch, but there was a really flat atmosphere right from the start. In spite if a big crowd, the only fans making any noise were Arsenal's. Since we have been at St.Mary's I can only recall one other occasion where that happened and that was the infamous Leeds game under 'Arry, where Saints were 3-0 up at half time and still contrived to lose 3-4. Turning up we found the team pretty much as expected, given the injuries and the stretched resources. Harry Lewis in goal and a back four of Martina, Stephens, Gardos (Yes, Gardos. After nearly two years out injured) and McQueen. Not exactly overflowing with experience. Midfield was Højbjerg, Harry Reed and Clasie. Up front were Sims, Long and Redmond. Arsenal had plenty of youngsters, but they also had Welbeck, returning from a lengthy spell out injured, Pérez, Walcott and Oxlade-Chamberlain. More than enough attacking talent for one team. Not to mention Sanchez lurking on the bench. 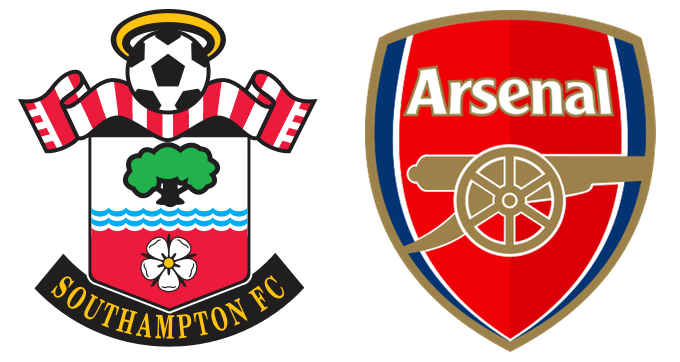 Arsenal were clearly up for it, snapping at the heels of Saints if they had the temerity to have the ball. The first goal when it came was made to look ridiculously simple by Welbeck. In spite of his time out, he is a talented player and his speed of thought was several levels above Saints. Only 15 minutes had gone, but the only surprise was that Arsenal hadn't scored before then. The second goal came along on 22 minutes and again it was Welbeck making everyone else look pedestrian. Effectively the game was over at this point and it was simply a case of Saints attempting to keep the score down. No such luck, next up it was Walcott out-thinking and scoring. This was just after the half-hour and we were 3-0 down. They were scoring roughly one goal every ten minutes, stopping them scoring 9 in 90 minutes would need Saints to step up a few gears, or Arsenal to back off. Probably both. Half-time arrived without any more damage being done, but there was a very subdued atmosphere on the Saints terraces. Needless to say, the Arsenal fans were having a whale of a time. The second half started with little in the way of change, until past the 60th minute when Puel brought on Tadić for Isgrove and Redmond for Long. Instantly they looked better balanced and strangely Højbjerg looked more effective as well. The resurgence was stifled in less than ten minutes by that man Walcott again. 0-4. There was a depressing air of inevitability about it all. Strangely enough young Lewis in goal was looking confident and dealing with what was thrown his way. I am not sure that all, bar one goal could be down to him. Stephens was looking a shadow of the player we saw at Liverpool and perhaps it was simply a question of him needing a more experienced team-mate. Gardos was very clearly rusty, yet he showed one or two glimpses of some potential. The final nail in the coffin of the game was delivered in the 84th minute by Theo Walcott for his hat-trick. This was the cue for many Saints fans to leave. Almost the entire row in front of me left and without their protection, I suddenly realised how cold it was. The match was like a giant bucket of cold water after the joy of reaching the EFLCup Final, but in the general scheme of where we are at the moment, I suppose it was to be expected. If Saints get a result at Swansea, then it might just have been worthwhile.